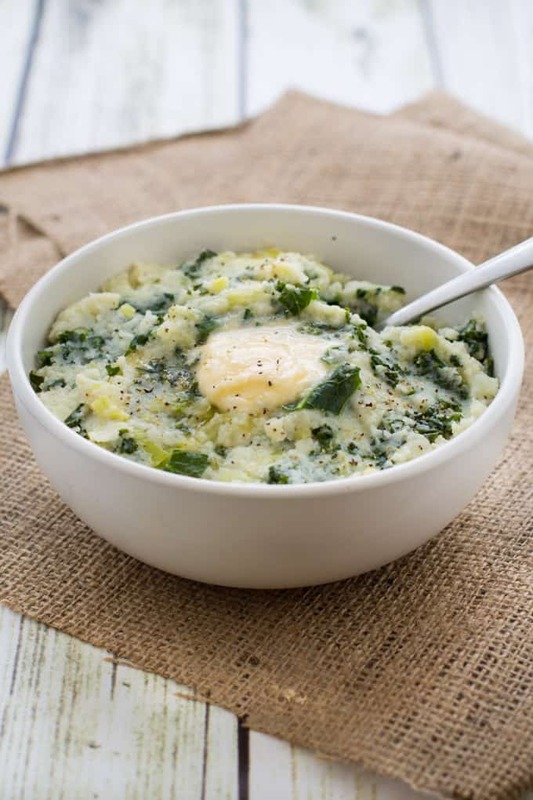 A plant-based spin on a traditional Irish dish, vegan cauliflower colcannon is the perfect side to make on St. Patrick’s Day. If you know me well, you know I’m a sucker for my Irish heritage. You know that I drool over Irish soda bread. You know that a good Irish ballad will bring me to tears. You know that I’ve never felt more at home during my travels than I did in Ireland. You know that I’m always down to party if Guinness and Jameson are around (preferable together in car bomb form). 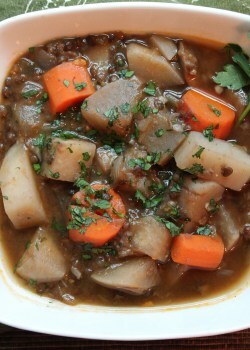 And you know that every year around St. Patrick’s Day, I invite friends over and make my favorite classic Irish dishes. 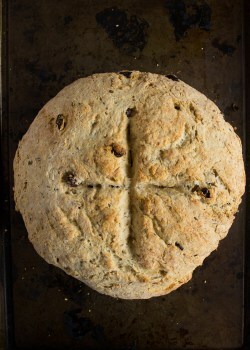 Last year, I switched up my regular Irish soda bread recipe for a Whole Wheat Irish Soda Bread that was equally delicious but with an added nutrition boost. 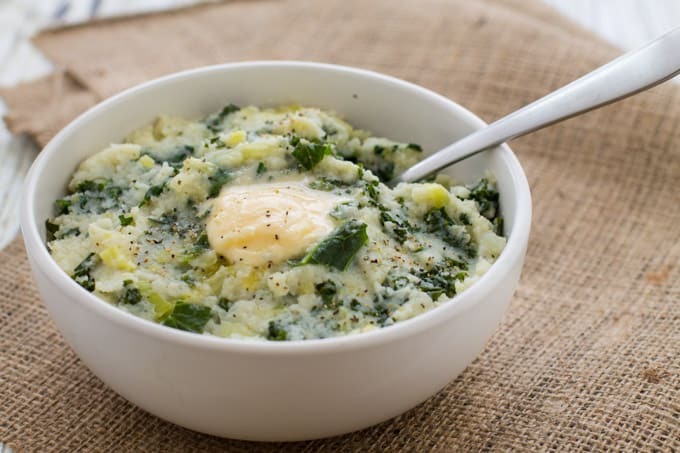 This year, I decided to make something that’s brand new to me altogether, colcannon. I figured I would make my own vegan variation on the dish and use cauliflower instead of potatoes and kale ‘stead of cabbage. I added some leeks and nutmeg for a flavor punch and used almond milk and vegan buttery spread instead of cream and butter. This dish was super satisfying and delicious. Hearty, filling and comforting. It was especially tasty since I kept tradition and put a wad of buttery spread in a well in the colcannon. Love the hint of green from the ribbons of kale too – so festive. I’ll definitely be adding this dish to my St. Patrick’s Day repertoire. 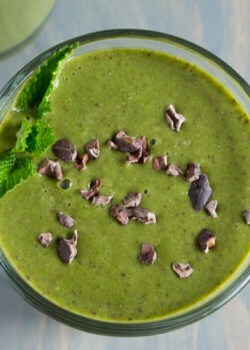 Stay tuned next week for another green recipe! Steam cauliflower florets until fork tender and transfer to a food processor. Add almond milk and 2 tablespoons buttery spread and pulse to a smooth, creamy puree. Meanwhile, heat olive oil in a large saute pan over medium heat. Add leeks and cook for about 5 minutes, or until tender. Add garlic and cook another minute, or until fragrant. Add kale and toss to coat. Add water, cover and cook for 3-5 minutes. Remove cover and reduce heat to low, stirring occasionally. Cook for another 10-12 minutes, or until kale is tender. Season with nutmeg, salt and pepper. Fold cauliflower puree into the kale mixture until combined. Transfer to a baking dish and make a small well in the center of the dish. Place under broiler for about five minutes, or until lightly browned on top. Place remaining buttery spread into the well. Serve immediately. You may need to add a little more water to the kale if it’s starting to dry up while cooking. My mouth is truly watering at these pictures!! This looks absolutely delicious. Totally saving the recipe. Love love love this idea! I want to dig in right now! Yum, I’ll be trying this soon. YES! This year I’m going to make this St Patty’s Day dish. Have cabbage, have potatoes…hope mine turns out as pretty as yours! Woohoo! Let me know how it turns out! Happy St. Paddy’s, Serena! I’m not a vegan, but I want to become one. I love this recipe. I’ve been on a cauliflower kick, it seems, for years. Must try this recipe! Haha thanks, Liz! You mean you were eating cauliflower before it got popular?! I always knew you were a trendsetter. 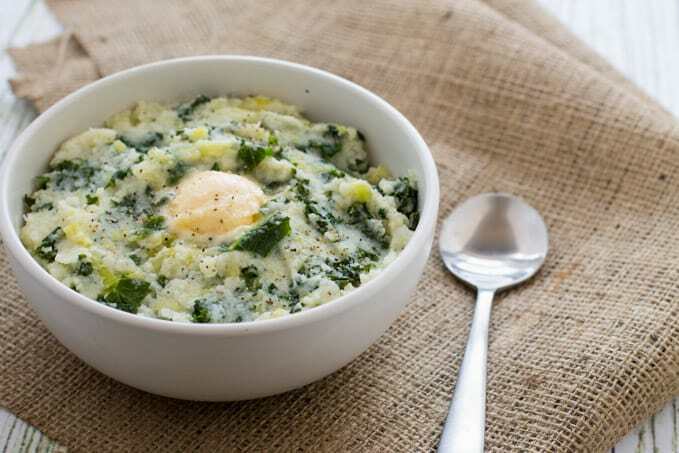 I’d never heard of Colcannon before but it sounds delicious! Love your veggie-packed, vegan version! You would never know this was vegan <3 Perfection! 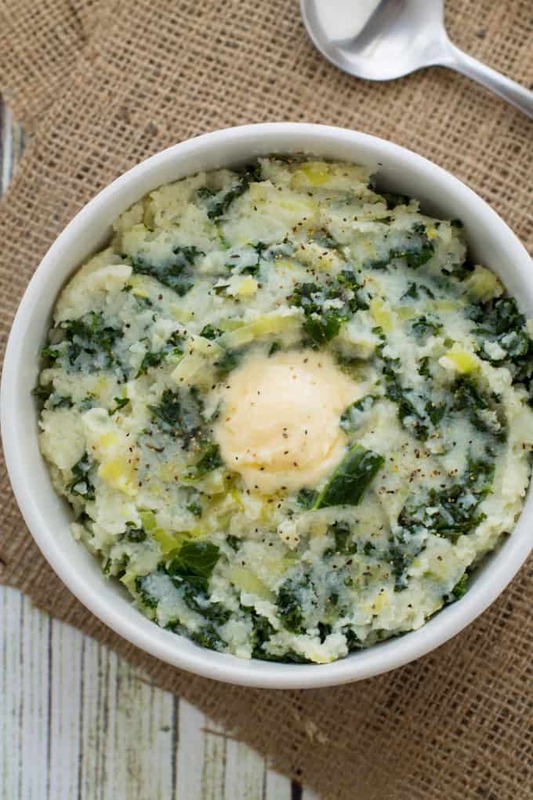 I had never heard of colcannon, but it sounds amazing. And I love how you lightened it up here because I’m sure it’s just as good. I may have to try this out next week! Thanks, Natalie! Let me know what you think if you try it! i have not heard of this dish…but i could see how deliciousssss this is! Thanks, Dixya! I only recently heard of it!